Hickory dickory dock. Did you ever wonder why the mouse ran up the clock, then ran back down? This little mouse was, in fact, a mother mouse frantically searching for her two missing sons. She looked for them all over the house, while also trying to stay one step ahead of the sneaky house cat. 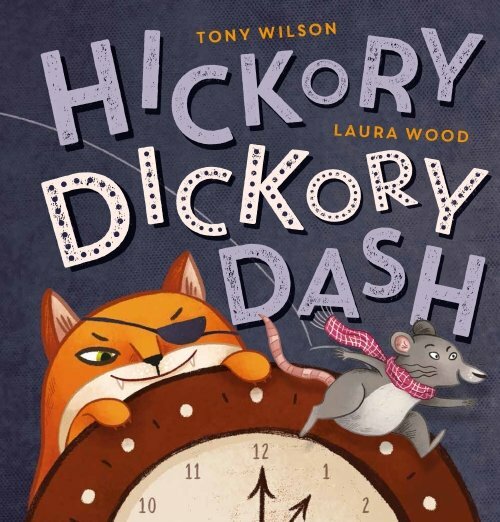 Hickory Dickory Dash, the second collaboration between Tony Wilson and Laura Wood, tells the background story of another well-known nursery rhyme. The rhyming text moves the story along at a fast and suspenseful pace as we try to keep up with mother mouse making her way around the house. The book provides a clear timeline of events by stating the location and time on each page (e.g. playroom 11:02 PM; kitchen 11:15 PM). Kids will have great fun learning about time by changing the dials on a clock to match the time of events in the book. The rhyming text makes this story a fantastic choice for children working on the /k/ sound in the middle and ends of words, see below for the list of /k/ words found in this story. For further speech and language targets in Hickory Dickory Dash, see the list below.